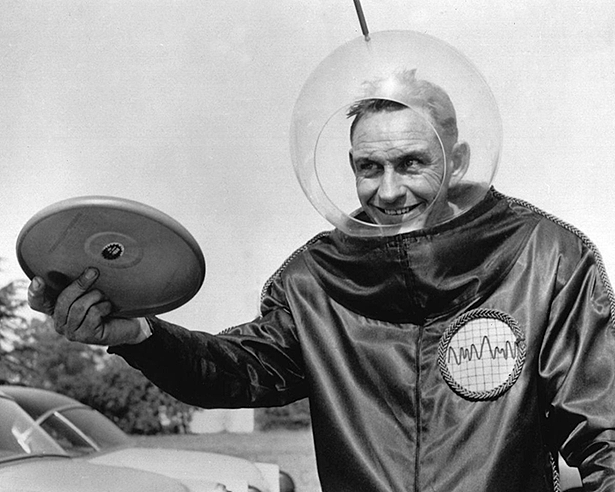 Above, top: Walter Frederick "Fred" Morrison in 1957, with the invention which would eventually become known as the Wham-O Frisbee. 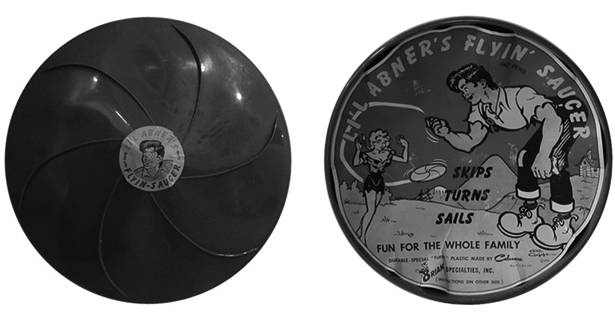 Variously attributed to being inspired by a pie pan or the lid of a popcorn can, in 1946 Morrison produced the toy in metal, calling it the Whirlo-Way -- which he and his wife Lucille hawked at fairgrounds and various popular beaches. Two years later, Morrison teamed with investor Warren Franscioni, who financed molding the design in plastic -- renaming it the Flyin-Saucer (bottom two pictures, with the Disneyland Tomorrowland imprint and a version drawing on the popularity of the comic strip Li'l Abner). In 1950 Franscioni left the partnership and Morrison bought rights to the mold, producing the toy under the new name of the Pluto Platter. In 1957 the Wham-O toy company bought the rights from Morrison, and bestowed Frisbee as its final name. Story on Morrison and Franscioni below. For shipboard operations the Navy has a new jet fighter which hurtles through the air at speeds over 600 miles per hour. Designated the Chance-Vought XF7U-l, the jet fighter recently completed its initial flight tests. The plane is a flying wing of the swept-back type, and has two turbojet engines. Two vertical stabilizers and rudders are located on the trailing edge of the wing, but longitudinal and lateral control are obtained through a pair of "ailevators" -- combined ailerons and elevators. The plane can be brought down to shipboard landing speed by extending two slats in the leading edge of the wing. 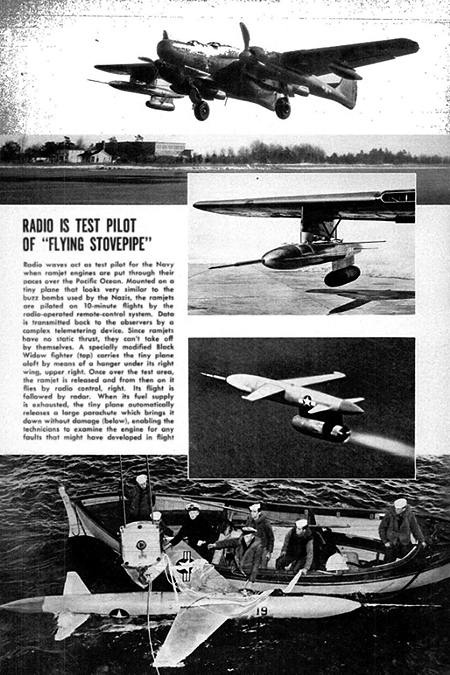 Radio Is Test Pilot Of "Flying Stovepipe"
Radio waves act as test pilot for the Navy when ramjet engines are put through their paces over the Pacific Ocean. 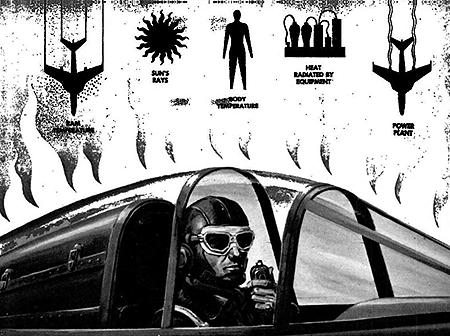 Mounted on a tiny plane that looks very similar to the buzz bombs used by the Nazis, the ramjets are piloted on 10-minute flights by the radio-operated remote-control system. Data is transmitted back to the observers by a complex telemetering device. Since ramjets have no static thrust, they can't take off by themselves. A specially modified Black Widow fighter (top) carries the tiny plane aloft by means of a hanger under its right wing, upper right. Once over the test area, the ramjet is released and from then on it flies by radio control, right. Its flight is followed by radar. When its fuel supply is exhausted, the tiny plane automatically releases a large parachute which brings it down without damage (below), enabling the technicians to examine the engine for any faults that might have developed in flight. Why pilot gets hot: Ram temperature, caused by friction of wings and fuselage against air, rises rapidly with speed. Sun's radiant heat pours through transparent canopy. Then there's also heat from his body, from the plane's electrical and hydraulic equipment, and from its engine. Researchers seek ways to keep "ram temperature" in supersonic flight from melting planes and cooking pilots. Now that jet power and airplane streamlining have cracked the "sonic barrier," aeronautical scientists are tackling an even tougher foe: the heat barrier. You've seen what that can do to a flying object if you ever watched a meteor flaming through the night sky. What made the meteor flame into vapor was its friction against the air when it dived into the earth's atmosphere from outer space at 20 miles a second. 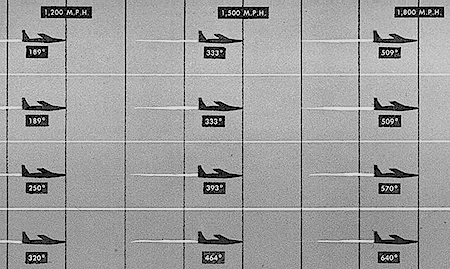 In an airplane flying not much faster than today's jets -- and only 1/100 as fast as a meteor -- that same kind of friction could melt the plastic canopy, burn out the controls, and broil the pilot. Airmen call this friction heat ram temperature. It's caused when any solid object rams into air hard enough to compress its molecules against one another. Reciprocating-engine planes don't go fast enough to make this a problem. But in jets, ram heat shoots up high enough to require cockpit refrigeration. The skin of a jet fighter doing 650 m.p.h. near sea level on a hot day gets up to 170° F. Other sources of heat -- the sun's rays, the pilot's body temperature, and the plane's electrical equipment and power plant -- would bring the cockpit up to 200° but for its refrigerating system. How to handle ram temperature in ramjet planes (PS, Jan. '49, p. 130) and in rocket ships -- skin temperatures as high as 1,500° F. have been recorded in V-2s -- has become a top-priority research program. Air temperatures in Fahrenheit are shown at left on chart, ram temperature under each plane. In thin air of same temperature at 50,000 and 70,000 feet, ram heat varies only with speed. This research looks in three directions: finding out how much heat the human body can stand (PS, March '48, p. 130); improving cockpit refrigerators (PS, March '48, p. 110); and seeking better materials for airplane skins and other parts that will stand the soaring temperatures of supersonic flight. Results so far are hopeful. Experimenters at the University of California have found that the human body can -- for a short time -- take temperatures that would cook meat and boil coffee. If a man can live in that heat, maybe ways can be found for him to work and think straight in it. Refrigeration engineers say they have developed coolers that would keep a cockpit livable at 2,500 m.p.h. Some of these cleverly use ram and engine heat to offset their effects. The latest is merely a refinement of the old-fashioned icebox. When a better one is needed, the engineers count on the cooling effect from evaporation of liquid oxygen, which boils at -297.4° F.
Cockpit coolers are shown in order of efficiency. first, at left, uses outside air to carry heat from refrigerator in reciprocating-engine planes. In next, expansion of ram-compressed air helps cool expanding air from compressor of gas-turbine engine. Third cools ram air with ram air. the fourth, good up to 2,500 m.p.h., is described in the photographs at the bottom of next page. And metallurgists figure that a stainless-steel plane could clip off 2,800 m.p.h. at sea level -- more higher up -- without wilting. A plane of titanium (PS, Dec. '48, p. 105) might be even better. Luckily, the fact that supersonic planes will fly high will help to keep them from burning up. For one thing, the air is cooler up there: -67° F. between 7½ and 25 miles above the earth when it's 100° just off the ground. More important, air density decreases with altitude. And the lighter the air, the less its friction against a plane flying through it. At 100 miles up the molecules are more than 30 feet apart, and ram compression is negligible. It will remain a problem, though, at any altitudes airplanes are likely to attain in the next few years. And where ram temperature leaves off another heat problem takes over. This is the increased heat from the sun. It works two ways, heating both the atmosphere and any exposed surface. Above 25 miles, atmospheric temperature reverses its direction. From there, it rises irregularly like a fever chart. At 75 miles it reaches 215° F. And any object up there is also heated by direct radiation from the sun. Just outside the earth's atmosphere -- about 200 miles up -- the sun's radiant heat alone would warm a house on the coldest day. There's nothing much up there to block either its rays or cosmic-ray particles. Add radiant heat, plus the extreme outdoor temperature, to the terrific combustion heat from a rocket engine strong enough to push a space ship to the edge of the atmosphere; then substract [sic] the cooling effect from expansion of the engine's liquid fuel into gas -- and you have a good-sized problem in cabin air-conditioning. You also have the makings of a solution. Precise controls might balance the heating and cooling. Maybe it would help to give the steel surface of your space ship a high polish on one side and a coating of dull black paint on the other. The polished surface would reflect off 85 percent of the sun's radiant heat, while the black surface would soak it in. You could then partly air-condition your ship, heating it or not as needed, by rolling it over in flight. Or perhaps you would avoid the sun's heat by flying only at night. You'd have to be careful, then, not to whizz around the world from night into day -- and smack into the heat barrier. CLEARWATER, Fla. (U.P.) -- Police chief H.E. Benson of the Safety Harbor community near here and Plumber W. Gussie Wilson said Monday they sighted a "flying grindstone as big as four Army planes" streaking southward across the sky and emiting [sic] a "greenish-white light." The mysterious object, they reported, was traveling between 400 and 500 miles per hour at an altitude of 2,500 feet. St. Petersburg, Feb. 1 (INS). St. Petersburg residents are scanning the skies for another sight of a new "flying disk." Police Chief H.E. 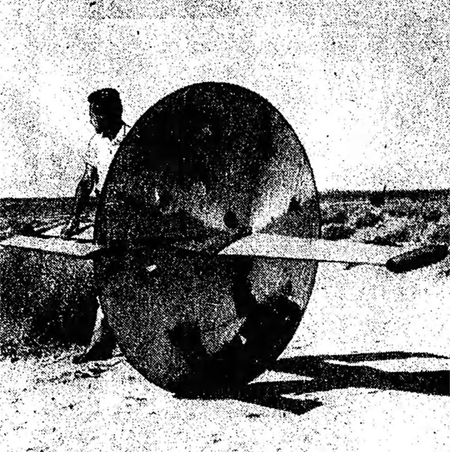 Benson of nearby Safety Harbor, and W. Gus Wilson, also of Safety Harbor, reported that they saw a "round, whirling disk, larger than an airplane" travelling at terrific speed shooting across the sky. "The disk was traveling faster than jet planes in a southward direction. It was perfectly round and larger that [sic] the biggest Army plane. "It had a greenish color with white streaks at the edges. "The disk looked like a grindstone giving off sparks when an ax touches it." Those "Men from Mars" were flitting around in the ozone above Pinellas county in their "Flying Saucers" yesterday according to a number of reputable citizens who will swear to it on a stack of Lil Abners. Among the first to report the "visitors" was Safety Harbor Police chief H.E. Benson and W. Gussie Wilson, a plumber. Chief Wilson said he saw a large round whirling disc "headed south which appeared to be going between 400 and 500 miles per hour. It was perfectly round and appeared to be as large as four of the biggest army planes. The object formed a complete circle and threw out a strange greenish light with white streaks on the edges." Previously, Herman Thompson, a commercial fisherman of Palmetto, reported to the Fifth air rescue base at MacDill Field that he saw a "plane" burning early yesterday morning. Thompson was fishing a few miles off Tampa bay at the time. MacDill has received no report of a missing plane and search by the local coast guard has found no wreckage or other evidence of a plane crash in this area. From time to time reports of "Flying Saucers" crop up, usually reported by occupants of planes. The pattern is always the same . . . "large round whirling disc . . . going about 500 miles per hour . . . throwing out a strange greenish light with white streaks." Never are the "whirling discs" observed during daylight. Recently the pilot of an American airline plane reported one of the "disc" [sic] flew alongside his plane over Alabama. He announced that he saw the heads of the passengers showing through the windows of the monster which was as big as a freight car, and which whizzed by his plane, which was flying along at a 250 mile clip. City Publicity Director Press Phillips takes a saner view. "Undoubtedly," Phillips stated, pausing briefly from his daily chore of mailing pictures of girls in swin [sic] suits to Northern newspapers, "undoubtedly, what these people saw yesterday was actually men from Mars who had heard about the wonders of St. Petersburg and the Gulf Beaches. Thus far none of these visitors from another planet have registered at the chamber of commerce but I shall certainly notify The Evening Independent just as soon as they do. I understand people from Mars have little propellers protruding from their foreheads and I believe I will recognize them". Editor's Note: Shame on (C.W.) U. and you too, Press Phillips for not recognizing a winter visitor in a hurry to get away from it all. The "ball" shape? Merely snow and ice collected in a fast trip from the Mid-west. 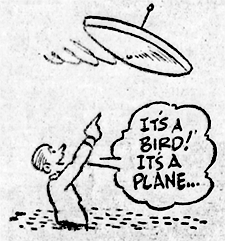 "Flying Saucer-itis," the epidemic which struck many parts of the nation in 1947, came to Pinellas County again early yesterday morning. Ready to swear they saw a huge round object flying over Safety Harbor about 1:30 a.m. are the town's rotund police chief, H.E. Benson, and W. Gussie Wilson, a plumber. "The large round whirling disc . . . was headed south and appeared to be going between 400 and 500 miles an hour. It was perfectly round and appeared to be as large as four of the biggest Army planes. "The object formed a complete circle. It threw out a strange greenish light with white streaks on the edges." Benson, who tips the scales at 300 pounds plus and should know something about size, said the saucer was "as big as a circus ring." That high-speed bugaboo of the airways, the flying saucer, has now scared the bejabbers out of two town visitors . . . the newest cycle started yesterday after The Times reported that up-country people had seen the saucers . . . yesterday Mrs. J.D. Bonner and Mrs. Mary Jackson, Dayton, O., visitors staying at 14712 Gulf Boulevard, were frightened by the same thing . . . contrary to early reports they claimed the disk was about the size of a waste paper basket, seemed to be traveling very low right past the windows . . .
. . . and then it shot up into the air over the Gulf . . . the ladies said it was bright green in color and "shot fire" . . . both said they saw it while in the sunroom of their beach residence . . . where it will all end, knows no one . . .
Could It Be Recurrence Of Flying Saucers? There were all sorts of suggestions projected Friday night as a discussion mounted here about the "ball of fire" that appeared in the clear blue sky in the southwest late Friday afternoon. The bright, large orange light was noticed by some about 5:40 p.m. Friday. 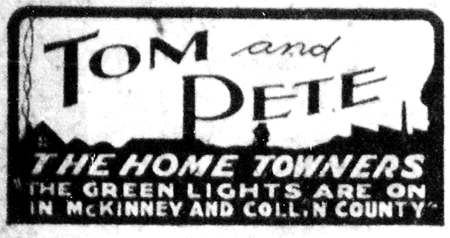 A call from T.J. Holloway brought the light to attention of employees at the Daily Courier-Gazette who watched it until it faded out of sight, seemingly staying in approximately the same position, until it grew dim and could no lonker [sic] be detected. "Flying saucers", the setting sun on a small cloud, "something advertising the fat stock show" or an Army experiment were all some of the conjectures spectators advanced. But most of those who watched it were in a quandary what it might be and were hoping a plausible explanation would be forthcoming from weather bureau observers. BOMBER crosses U.S. in three hours and 46 minutes. It certainly is a big country, wasn't it? The B-47 flew from Washington to Washington quicker than you could say D.C. The next record-breaker will be the B-4. That gets there B-4 it starts. Even the B-47 goes faster than a dollar and higher than taxes. This bomber can hit its target and get home before the pieces come down. On the cross-country trip, the pilot had to slam on the brakes at Chicago -- or learn French. At this rate you can telephone from Los Angeles and answer yourself in New York. Six jet engines pushed the average speed to 607 miles an hour. The jet is like dropping a paddy-wagon full of cops in the middle of a traveling dice game. They blow one way and the plane blows the other. Six of these on your automobile and you could take all the curves out of Route 66. The B-47 crossed the U.S. quicker than the Communists. Given enough fuel, this plane could leave the U.S. today and be back yesterday. It can go around the world faster than a peace feeler. The flying saucers were fast, but this takes the cup. For a coast to coast trip, the airmen didn't do much coasting. The Russians are now moving Minsk closer to Pinsk in an effort to get the speed record back. Pilots for the record-breaking transcontinental trip were Schleeh and Howell. That's just about how the B-47 sounded en route.
. . . The new Northrop flying wing B-49, largest and fastest jet bomber in the world (which can fly from London to Moscow in three hours, plus a 30,000-lb. bomb load), wouldn't be the result of those Flying Saucers, would it? . . .
DAYTONA BEACH, Feb. 15 -- (AP) -- Beach visitors these summer-like days are doing a double-take. They swear they see flying saucers -- and they're right. The air is full of them. A pair of former air force officers from California are responsible for the saucers -- and a new game. Warren Franscioni and Fred Morrison of San Luis Obispo, Calif., got the idea by tossing pie pans, sailing them in the wind. 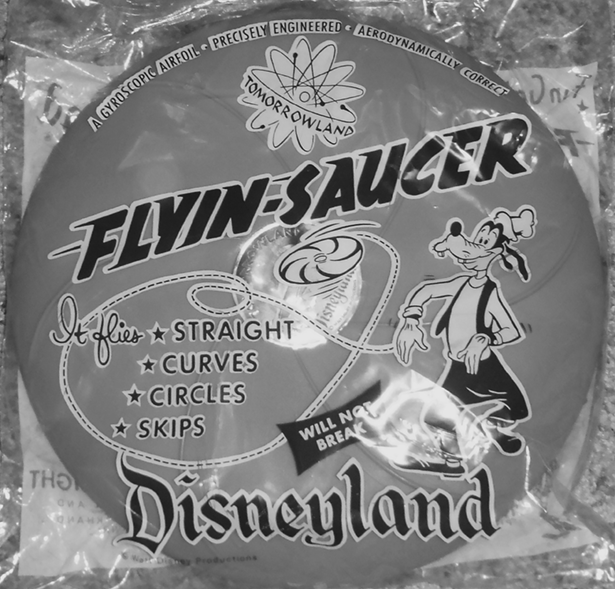 They had a special disc made out of plastic and that became the flying saucer -- or it you want to be technical, a precisely-engineered gyroscopic airfoil, aerodynamically correct. The two young men -- who call themselves the world champion flying saucer pilots -- will tell you it's no easy job playing catch with the spinning discs. Certain ways of throwing them can make them boomerang or simulate a baseball curve. A player has to be on his toes, especially in a strong wind, or run the risk of getting bopped on the bean. Morrison and Franscioni applied for a patent on the idea and have started out to promote their sale. They suggest football coaches might be likely customers. And they point to the Nemeth, Calif., high school team, which used the saucers in conditioning work last fall to point up balance and alertness. It may be a coincidence, the saucer inventors admit, but Nemeth's coach turned out his first championship team. Why did these young promoters come all the way across the country to make their first resort promotion? They said just when they were ready for an extensive west coast buildup -- it snowed in California. Yes, really. Another "fireball" streaked through New Mexico skies Monday night, and Dr. Lincoln LaPaz, head of the Institute of Meteoritics at the University of New Mexico, again appealed for persons seenig [sic] it to report to him. Monday's fireball was seen from the control tower of Kirtland Field, and from an airplane near the city. Both reported it a brilliant red "fireball" falling vertically. From the Kirtland tower it was 10 degrees west of south. Dr. LaPaz asked all persons who saw it to report to him its color, brilliance, and its direction when last seen. Observers in Albuquerque can telephone his office at the university. Those elsewhere in the state can write. Last "fireball" seen here was on Jan. 30, when a greenish one raced horizontally east of the city, and was seen by residents of two states. Dr. LaPaz headed a party which traced it into West Texas, but was unable to find any trace of the object reaching the earth's surface. R.D. Grenovle, who lives about four miles out on Highway 10, thinks he might have an answer to the flying saucer craze which sweeps the county periodically. Walking through a wheat field near his home yesterday he came across what he at first thought might be a bomb. He pulled the red cloth covering the object off very gingerly and uncovered a shiny metal box. Upon closer inspection it turned out to be a weather bureau instrument called a "radiosonde". Mr. Grenovle brought the instrument by for On the Square's inspection this morning, and then carried it on to the postoffice [sic] as directed by information on the box. It will be returned to the Weather Bureau. "Notice to finders: This instrument belongs to the United States government. "A balloon sent up by a United States Weather Bureau Station carried it to a height of about 12 miles. The balloon burst and the instrument came down slowly on the parachute. While in the air the instrument acted as a broadcaster of the temperature, pressure and moisture of the air through which it has passed. This instrument may be used again. Please remove the tag from under the flap and write the information required. If found in the continental United States, mail at any post office or postbox or hand it to your rural carrier. No stamps are needed. Thank you." Mr. Grenovle says it came down on his wheat field as neatly as if guided, missing trees and landing squarely in the cleared area. It was turned loose at Atlanta yesterday morning, apparently at 3 a.m. If that were true, it would have traveled the 150 miles from Atlanta in about seven hours. People in Milan, Italy, are the latest to report seeing "flying saucers." WASHINGTON, Feb. 19 (UP) -- The Air Force tonight announced successful completion of first test flights of a futuristic "Flying Triangle" designed to fly faster than sound. 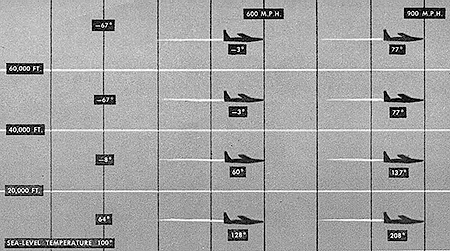 Speeds attained so far by the Air Force's newest -- and queerest looking -- research plane were kept secret. Flight tests are being continued at the Muroc, Cal., air base. The Air Force said the single-seat jet plane, labeled "Model 7002," was the first to fly with a so-called "delta" wing. The radically-designed wings with their 60-degree sweepback form an equilateral triangle jutting out of the back half of a stubby fuselage. A large triangular stabilizer and rudder -- which forms the tail assembly of conventional aircraft -- sticks up out of the fuselage close behind the pilot's bubble-type cockpit. Until "Model 7002" came along a wing sweepback of 35 degrees had been the most extreme on any Air Force plane. Not considering the difference in wing sweepback, the 7002 looks something like a cross between the B-19 "Flying Wing" bomber and the chevron-shaped F-86 fighter, two of the stars in the Air Force show held here this week for President Truman, congressmen, and the public. Extensive wind tunnel tests, the Air Force said, indicated the delta wing has "low drag characteristics and satisfactory control in transonic and supersonic speed ranges." For only one American plane, the Air Force's X-1 rocket research craft, have speeds faster than sound been officially announced. The speed of sound is about 760 miles an hour at sea level. Model 7002 was designed and built by Consolidated Vultee Aircraft Corp., San Diego, Calif. It is powered by Allison J-33 turbojet engine. The plane is 41 feet long and 18 feet high. The trailing edge of the wing -- the base of triangle -- measures 31 feet. The craft weighs 13,000 pounds. 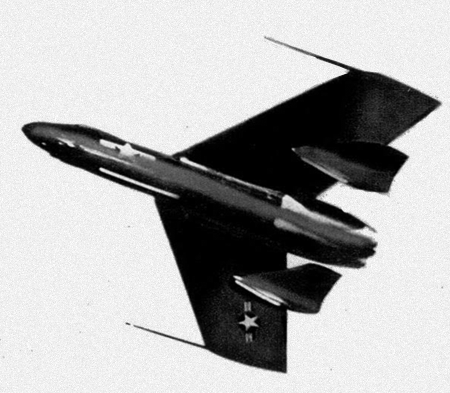 It originally was designed as research prototype of an interceptor fighter, the XF-92, to fly above 40,000 feet. Plans for production of the F-92 have been dropped but research will continue on the 7002. The University Institute of Meteoritics and the Civil Air Patrol will start a ground search today for the fireball that streaked across the Albuquerque sky last Thursday at 5:59 p.m. The search will extend through the Acoma and Laguna Indian reservations as far west as Grants and as far south as Magdalena, Pie Town and Reserve, said Dr. Lincoln LaPaz. The fireball, seen by hundreds of Albuquerqueans, was described by some as being a crimson color, much brighter than the moon. A curious aspect of the train of light was the fact that every observer agreed that it ascended from some spot west and south of Albuquerque, turned to the left in a gradual arc and was gradually going up when it disappeared. Its visible flight lasted six to seven minutes. "As yet," reported La Paz [sic, should be LaPaz], "we have no observers who were west of the phenomenon in the region of Grants, Magdalena, Laguna and Pie Town. What we especially desire is to know the color, shape, size, and direction eye witnesses were facing when it was last seen." Reports should be phoned directly to the Institute of Meteoritics or to his home here, said La Paz. TEST FLIGHT -- Designed as high-speed tow target, disk was hauled aloft behind Vultee training plane. Inventor is former military test pilot at Air Force desert field. HONEST, IT'S REAL! -- Here's six-foot all-metal flying disk that alarmed authorities after they found it hidden in desert shack but a few miles from Muroc test base. Remember the confused stories and the furor? Well, another one -- a real one -- has turned up! "There's a big flying disk hidden in a dilapidated old building out on the desert . . ."
Dubiously, investigators checked the story. In a weather-beaten shack just a few miles from the Air Force's highly-secret Muroc test base they found an all-metal flying disk six feet in diameter with short horizontal surfaces tipped by odd looking tubes. Two feet thick at the hub, it apparently rotated in a vertical plane as it flew -- and obviously had been wrecked, for the knife· edged circumference was badly smashed at one point. With visions of the Muroc base as a target for sudden attack by disk weapons, authorities went to work quickly. The trail led to a pin-neat little house at 5454 Chesley Ave., Los Angeles, the home of Roy Wolford, former Air Force test pilot at Muroc. "Sure the disk was mine," he told The Times yesterday. "I designed it as a high-speed tow target and had been testing it at Helendale Field, a former military strip out on the desert. We were towing it behind a Vultee trainer, but the line broke shortly after the disk left the ground. It crashed and we carried it back to the shed for safe- keeping. Wolford explained the tubes on the tips of the stubby wings were merely small smoke pots to outline its flight path in the air. A friend, Herman Latta, helped him build the disk, he said, and Pilot Vic Cunningham flew the trainer. He hopes to patent the tow target, he added, pointing out that the disk is highly maneuverable. The desert testing was explained as necessary to assure secrecy for the development. Authorities thanked Wolford and closed the case with sighs of relief. But the mystery of the flying disks lingers on . . .
SYDNEY, Monray [sic]: Army authorities issued a warning tonight against a possible "flying saucer" scare tomorrow. The army will release about 100 meteorological balloons tomorrow and Sydney people are asked not to panic into a belief that they may be "flying saucers." The fireball which was seen west of Albuquerque a week ago fell much farther west than was at first believed, probably in Arizona. Dr. Lincoln LaPaz, head of the Institute of Meteoritics at the University of New Mexico, so reported Monday on his return from a trip to Gallup is search of remains of the fireball. Dr. LaPaz reported observers in Gallup saw the fireball southwest of them. He concluded it probably fell over Arizona, but could have fallen still further to the southwest, in California or Mexico. At first he had believed the fall occurred in the Mogollon mountain area in southwestern New Mexico. The fireball was the second in two weeks seen from the Albuquerque area. Dr. LaPaz traced the first, which occurred the night of Jan. 30, into West Texas, but was unable to find any trace of it reaching the earth. As great a mystery is developing about "Russian flying missiles" which are reported to have fallen in Bavaria as about America's "flying saucers" and the streaks in the sky and explosions in Scandinavia. Conflicting stories are coming out of Bavaria about the missiles, and even statements alleged to have been made by US officers in Germany do not agree. Bavarian police officials have informed US Intelligence officers that four mysterious missiles have landed and exploded in the Gaedheim area, about 125 miles south of the Soviet zone border, between the summer of 1945 and January 31, 1949. Some reports, however, say that they fell between October 1946 and January 31, 1949. Eye-witnesses declare that some of them emitted a 16-ft. trail of blue flame, and estimates of their speed vary between "faster than a rifle bullet" and "not at all fast." The craters were a foot deep, and six feet vide, and white metal splinters were found around them. The disparity in statements by US officers is extraordinary. According to one newsagency [sic], one officer said that the missile which landed in January was "an ordinary rocket with nothing unusual in its construction." He said that it had apparently been fired in practice and had strayed from its course. Other stories are that the Americans are still studying the fragments, but have been unable to identify the propellant. The Deputy-Director of US Intelligence (Col. W.L. Fagg) emphasises that only Germans have claimed to have seen the missiles, and the army, after a full investigation, regards the episode as "inconsequential." He points out that no trace has ever been found of a missile. BRITISH rocket technicians have completed blueprints for a real flying saucer. It is an inhabited space-station to cost £130,000,000. US Defence Secretary James Forrestal has reported to Congress that American military experts have begun research on "earth satellite vehicles." Scientists consider they may be used as rocket-launching platforms in the next war. Chief British rocket designer H.E. Ross, of High Wycombe, Bucks, England, says that the saucer would be 200 feet wide, weigh 2000 tons. Prefabricated on earth, it will be taken up piecemeal by piloted freight rockets in 66 journeys, beyond the pull of the earth's gravity. "The bits would not fall, but would circle the earth, passing over exactly the same spot at precise intervals," Mr. Ross said. "So, though we might lose an odd bolt, we would be able to pick up all the main parts, locating them with radar." Engineers in space suits, Mr. Ross says, would have little difficulty in handling the heaviest girders because they would be weightless. Hammers and screw drivers could be put down on nothing, and would not drop, but would follow the man at a speed of 6500 miles round the earth. 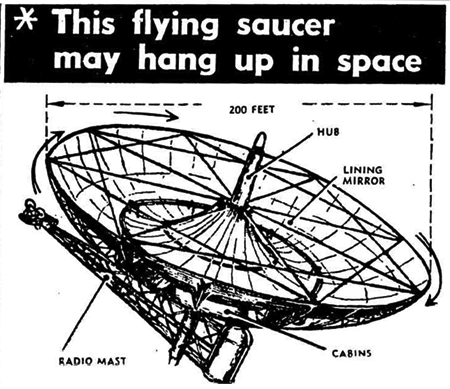 Power from the sun's rays would spin the saucer after it was assembled, and produce an artificial gravity. 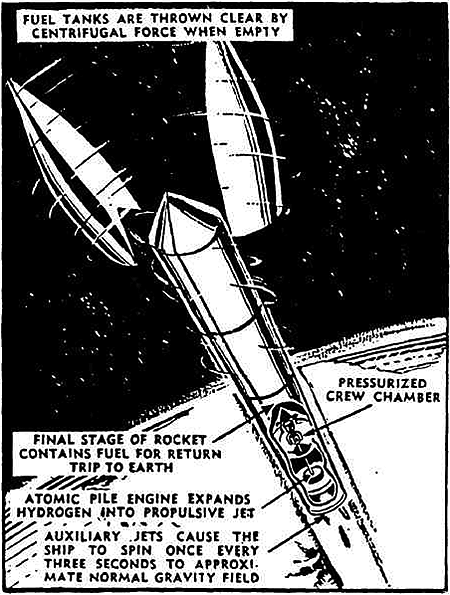 Liquid hydrogen heated by an atomic pile would power the rockets which would carry the saucer to its height. Within each rocket men could move about normally despite its speed of seven miles a second, on account of auxiliary jets which would spin the rocket three times a second and produce sufficient centrifugal force to imitate gravity. Apart from its possibilities in war time, the saucer could provide accurate weather forecasts for the world. It might give a re-diffusion television service which would ensure worldwide cover. MELBOURNE, Sat. Two strange objects resembling "flying saucers" were seen at 12.10 a.m. today at Sale by Mr. S.K. Gibbs and surveyor Ian Haynes. Mr. Gibbs said the objects were circular, very bright and appeared to be travelling at great speed in a westerly direction from Sale. Mr. Haynes estimated their height at 2000 ft.
Mr. Gibbs said he rang the Weather Bureau in Melbourne but it could not help him identify the objects. 1. Pictures and a fascinating history of the Consolidated-Vultee Model 7002 featured in the article 'Flying Triangle' Better Than Flying Saucers - It's Real can be seen here. 2. In the article This flying saucer may hang up in space it is stated that a future space station could create "artificial gravity" by spinning (so as to create a centrifugal force). The process and problems of doing so were discussed at Cornell University's Ask an Astronomer, which can be read (via Google cache) here.